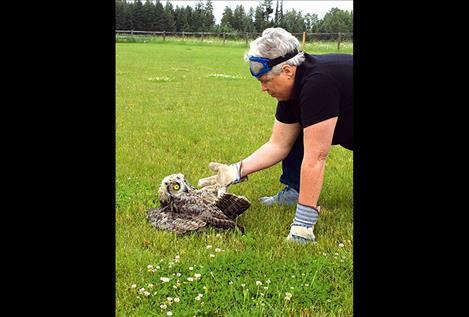 A frightened young great-horned owl studies GLS staff member Carolyn Hidy after being cut from soccer netting. “It was clinging to my finger so tightly I had dents afterwards,” Hidy said. This was the common consensus after Glacier Lake School staff and students looked into the bright golden orbs of a terrified young great-horned owl last week. Staff member Ben Kestner discovered the owl caught in the soccer goal net as students arrived in the morning. He thought it might be one of the owlets that had hatched in the school’s tree earlier this spring. As a curious crowd of students and families looked on, the owl was finally freed of its restraints, but still lay motionless on the ground, gripping Hidy’s hand. She carried it to a fence post, hoping it was not so injured that it couldn’t fly.